With colorful flowers Pultenaea species are becoming more widely used in Australian gardens. They are drought tolerant, have good foliage and the flowers are certainly bright enough to liven up any landscaping project. 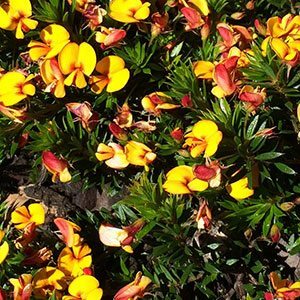 Pultenaea are commonly called ‘Eggs and Bacon’, a reference to the color of the flowers, they are also sometimes called ‘Bush Pea’. Most are erect or prostrate shrubs that flower from late winter to spring and are found in all states except the Northern Territory. Many varieties are naturally low growing, and forming a dense mat over time, these are a plant that makes a great ground cover. Use it in the garden border, grow it in a container or use them for underplanting taller growing plants. P. paleacea – Also known as the Chaffy Pea Bush this is a prostrate or spreading variety. P. verruculosa – Native to western Australia, not widely grown. P. tenuifolia – Commonly called the Tender Pea Bush, mostly from cooler temperate climates of Victoria. P. foliolosa – Known as the Small Leafed Pea Bush, fairly low growing. P. brachytropis – Another Western Australian species not widely grown. P. stricta – Interesting form with a more upright growth habit than most. P. indira – Another Southern Western Australian species not widely grown.